Paleontologists are using a range of old and new techniques to map the Broome Sandstone dinosaur trackways. 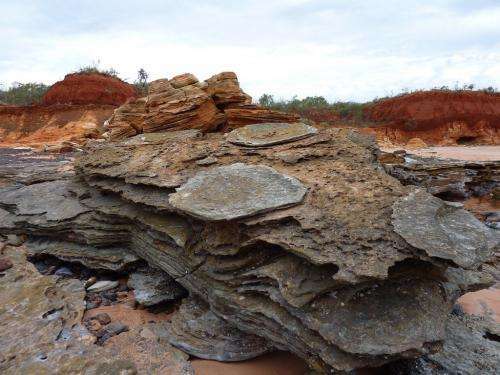 Project leader Steve Salisbury from the University of Queensland says the west Kimberley's known dinosaur tracks are on the cretaceous sandstone of the western Dampier Peninsula's intertidal zone. He says the tracks tend to disappear over time. "The coastline is really dynamic and even things that we documented last year, a number of those have disappeared with the last cyclone season," Dr Salisbury says. The best-defined tracks, he says, were originally made on silty mud that was wet enough to collect a clear impression, but which then dried out to be later preserved by under a layer of sandy mud. Both layers are now stone, and as surf erodes the more brittle upper layer, it sometimes exposes clear tracks underneath. He says the new techniques are necessary because these tracks are difficult to map. Being made by large animals, it is difficult for observers to get high enough above them to see a trackway, and hard to measure the distances between tracks on the rough sandstone reefs. "We have teamed up with a number of other groups that do either airborne digital surveys and/or ground-based laser scanning," he says. Dr Salisbury is also keen to work with traditional owners, who have tracking skills and cultural knowledge of the songlines associated with the footprints. He has just returned from a survey of trackways at the newly-estalished Yawuru Conservation Estate on Broome's outskirts, and at James Price Point. He says it is important to work with the individuals traditionally responsible for knowing the country's relevant song cycles, and he worked closely with Yawuru ranger Micklo Corpus and Goolarabooloo law man Phillip Roe. "The Goolarabooloo guys … they're quite adept at finding the tracks in the same way that they would be looking for tracks in sand," he says. "But the key thing is … culturally the right person has to be doing it regardless of whether they're a good tracker or not." Dr Salisbury says he plans to collaborate with other traditional owner groups on the northern section of the peninsula, and perhaps further north. Although he is yet to connect with traditional owners in the Bidyadanga region south of Broome, he notes that the relevant songlines also extend in that direction. The interdisciplinary team is planning a series of field visits over the next three years.